Afternoon and evening storms / squalls caused a change of plans on the last night / day! This trip came about because of a meeting of the minds. I needed to get out of the city for a few days and had previously discussed a summer camping trip somewhere in the South Florida wilderness with New York based paddler Johna Till Johnson of windagainstcurrent.com. We both wanted to do a multi-day trip and I suggested Florida Bay as I am very familiar with it and also because I knew that bugs there are really not that bad, even during the summer. The boat ramps at Flamingo are the gateway to much of Florida Bay! CLICK for more aerial and VR panoramas. Summer guest paddlers: Johna Till Johnson from New York and Jenn C. from Tampa preparing to launch. But wait – there’ll be one more! These flies were really the only bugs of consequence, esp. at Flamingo and on Little Rabbit Key. outside of the world of people! Florida Bay is essentially a tidal marine estuary shaped like a pizza slice nestled between the Florida Keys and the mainland. It covers about 800 square miles and is a part of Everglades National Park. As a kid in South Florida schools, I remember looking at the map of Florida on the classroom wall and seeing dozens of islands that nobody could tell me much about. Even today, many people are not very familiar with it. I’ve spent much quality time out there by myself over the years, so it’s always nice to be able to invite capable paddlers to share the magic of the ‘Bay with! Paddling on Florida Bay is largely dictated by the tides first, then the weather second. The reason is that there are several “banks” which are grassy mud flats on low tide and impassable. Thus the general plan is always be to paddle with a rising tide, lest you may get stranded for several hours on the flats! Because of this feauture, the ‘Bay receives fewer boaters and paddlers than say the Ten Thousand Islands or the interior Everglades. The general boating public does not venture into Florida Bay much, and the few boaters out are usually fisher folk in flats boats and in the main boating channels. They are also a more considerate and competent class of boaters! In the summer very few or no paddlers actually venture out past the roughly three mile zone south of Flamingo. For campers, there are two wooden chickee structures and a couple of islands to get out on. Although there are dozens of keys in the ‘Bay, most are just large clusters of mangroves with maybe a briny lagoon on the inside. Few have any actual dry land to get out on, and in fact the Park prohibits landing on any islands not designated for public access! During the summer there is no backcountry fee, but a permit is still needed and should be filled out at the Flamingo Ranger Station. All of the above add up to make Florida Bay the kind of place to really get away from it all! Once out past the first line of keys outside Flamingo, it is sometimes still possible to go for days without hearing any background noises or engine sounds. When sound happens it’s usually a plane high overhead or a boater somewhere in the distance and fades away quickly. So even though Florida Bay is surrounded by a busy world of people, once inside it’s like a step back into time. It’s easy to imagine what the string of Florida Keys must have been like before all the islands were connected by bridges! Paddling away from the horse flies and into a summer shower on Florida Bay. Summer in South Florida is the wet and rainy season and tends to be very hot! For paddlers the extreme heat and humidity can be risk factors for those unprepared. On any summer trip, it is essential to have up to twice the amount of drinking water that you think you need! This means ideally you should have up to 2 gallons (8 liters) of water per day. Most of us living in South Florida are habituated to the comfort of air conditioning, and it’s very easy to underestimate how much water you can sweat out! Also there is the ever present possibility of afternoon squalls and violent thunderstorms. This is really the main wildcard to deal with, although even in the summer the storms or lack there-of tend to come in batches. With keen observation, it is possible to find a window for camping and avoid storms. For one or two night trips, the odds can be good. However if you stay out long enough, the odds will eventually catch up, as we shall see! Johna Till Johnson of windagainstcurrent.com has about 10 years of paddling under her sprayskirt including a successful completion of the EC 300 (Everglades Challenge) with Vladimir Brezina. Jenn C. from Tampa, Florida is a lifelong outdoors person and athlete. While relatively new to sea kayaking, she shows great form and came well prepared! There was another mystery “paddler”, more of a sailor really that was Painen Dias! While the Banana Boat is my first choice for most outback touring, I elected to go with CLOUD9 (Venture Kayaks Orca 16) for this trip due to space constraints on the chickees. There is quite a lot I’d like to show you from this trip! Through my photography I’d like to impart onto you the feel of the full experience of being out there for several days. There are a lot of pictures, some illustrative of similar moments from other previous trips. Many images will have borders and are links to other related stories, trips and artwork you might also be interested in! Because this is a big story, five days – I’m keeping the writing to a minimum and going mostly with photos and captions from here on! Localized heavy rain in the distance ahead. Arrival at the Shark Point Chickee in the late afternoon. The SPC (Shark Point Chickee) fared well during Hurricane Irma in 2017 and was very clean. Shark Point Chickee is the tallest chickee in the Park and feels like an outback condominium! The tall elevation of the chickee allows great views of distant keys on the horizon! The cell phone tower at Flamingo as seen from the chickee imaged at an effective reach of 5600mm. The tower is 7.5 miles away across Snake Bight due west as the cormorant flies! Gorgeous sunset over Florida Bay from Shark Point Chickee. The big ball of fire dropping below the horizon! The ever changing color palette of a Florida Bay sunset. When there is no moon out, the glow of the lights from the string of Keys towns can be seen on the horizon from the chickee. The red light on right is the tower at Flamingo, due west! until you Florida Bay chill! A night on the chickee is probably the ultimate in camping tranquility. The absolute stillness and lack of any kind of background noises is pretty special and something not soon forgotten! Before the moon comes up, you can see the lights from all the Keys towns on the horizon to the south. To the east look for the “summer triangle” of stars. Read about the ancient origins and mythology of the triangle stars and enjoy the night sky! The Summer Triangle and Milky Way in the eastern sky over Florida Bay. The perpetual glow is the light pollution from urban South Florida! Later on the rising moon over Florida Bay lit up the nearby keys due east/southeast! Sunrise from my tent on the Shark Point Chickee. In the backcountry I find it impossible to sleep past dawn! Incredible Florida Bay panoramic scenery from the tall Shark Point Chickee. Snake Bight 360 spin around panorama on a similarly calm and flat morning. CLICK for more panoramas page! Florida Bay is a big place with big skies and lots of open water paddling. Navigation is not difficult, provided attention is paid the the tide and the locations of the flats banks. There’s no need for fancy GPS instruments, but a waterproof chart is a must have unless you know the route well. For us on this trip, we knew that we would have a rising tide each afternoon, thereby assuring us of timely arrival at our camping destinations! 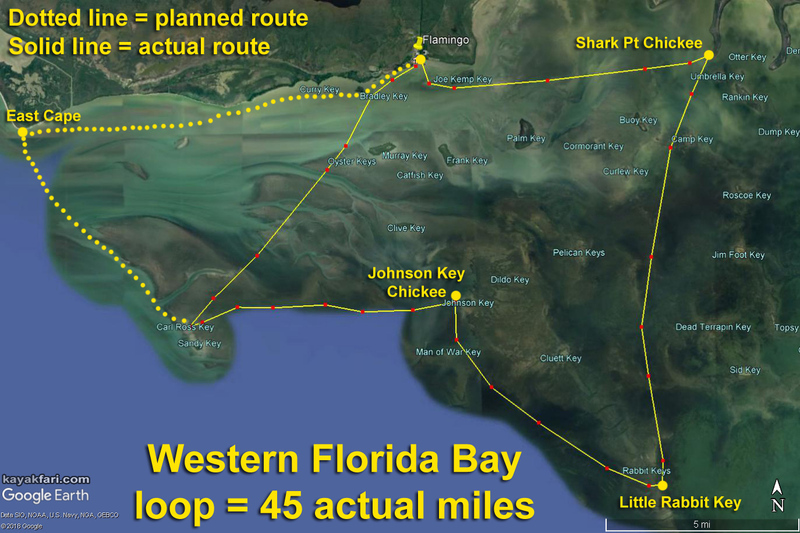 The chart shows the main channels and flats banks in central-western Florida Bay. Johna cruising on Florida Bay with a summer shower in the background. Land Ho !! Sighting Little Rabbit Key in the distance. ART of the Bay – Florida Bay Landscapes. Little Rabbit Key is a tiny island in the middle of nowhere on Florida Bay with a (usually) dry clay dirt interior for camping. It’s location along the main boating channel is popular with fisher folk both as a destination and a way point stop on their way elsewhere in the ‘Bay. Most tend to stay and fish in the deep channel that surrounds the island. During the day there were hardly any bugs except for the aforementioned horse flies. For some reason they were much more prevalent near the water than at the campsite, which was OK by us. The island is an amazing place with great sunsets and excellent night time sky viewing! Summertime inverse use of my space blanket to reflect the scorching sun off my tent! The clay dirt surface of the key has two peculiar features for camping. Firstly, if it has been raining a lot, the dirt will soak up the water and leave just a thin drier crust on the surface. If there’s a high tide during the night, it can push that water back up and re-flood the campsite! Second, the wet clay dirt can act like a heat sponge, absorbing all the day’s heat, and then releasing it all through the night! I remember one night a few years ago on this island, also in July when the dirt was so hot that it still felt quite warm in the morning! It was like a radiator all around my four season thermarest pad which blocked the direct heat, but it was still a hundred degrees in my tent! On this trip, the ground was just lukewarm, so not too bad for sleeping. The elevated chickee platforms are much nicer for sleeping well in comparison! Little Rabbit Key has a clay dirt interior like many other Florida Bay keys. The clay is mixed with vegetation, bird droppings, salt and water. Over time this creates a very tough rawhide-like surface crust. Freshwater is the most precious commodity out here – consider bringing 2x what you will need! Hurricane Irma passed over Florida Bay in the fall of 2017. There are areas that look untouched and others where lots of vegetation is missing and trees overturned. Little Rabbit Key fared well, with only some mangrove defoliation. The mangroves are blooming in the summer! Cell phone tower at Flamingo, 12.5 miles away, as seen from the dock at LRK! On the island, you are at the limit of line of sight of the cell tower at Flamingo to the north, and you can just make out the tall Long Key bridge from the south end. These both make excellent landmarks that make navigation easy, though you always need to watch out for the flats and shoals! The tall bridge at Long Key, 10.5 miles away due south from Little Rabbit Key! The ladies enjoying a fine Florida Bay sunset. There was actually quite a bit of storm activity in the late afternoon, the remnants of which you are seeing here! Extreme close up of the sun setting over Florida Bay. I made myself a delicious dinner very similar to this one with octopus in garlic sauce. CLICK: Tasty & Quick Cooking! Dusk colors of the big Florida Bay sky. Flamingo tower due north 12.5 miles away as the Pelican flies. It flashes two alternating red lights during the night. All sky 360 view of the Milky Way rising over Little Rabbit Key in black & white! The night on Little Rabbit Key was gorgeous once the clouds cleared away. Because the island is ringed by mangroves, there isn’t much of a breeze and there were some skeeters, but nothing that some clothing couldn’t deal with. I like to wear a cotton long sleeve shirt with possibly another light layer underneath. I’m happy to say that I didn’t need any bug spray, in fact I didn’t even bring any. I did have a bug shirt packed, just in case, as I always do! The Milky Way was rising early in the night, but we wouldn’t see it directly overhead this night as the post-full moon would glare it out later. On moonless nights this island is one of the darkest spots on the entire eastern USA seaboard! Later on the moon came up and rode across the sky over the little island. The Supermoon of 2016 and the full moon camping experience at Little Rabbit Key! The morning was fresh and clear, just like this. Bless!! A White Heron catches an eel on the flats surrounding Little Rabbit Key. The tranquility of the morning was shattered by this trashed plastic bottle floating by. All that trash – the ugly side of kayaking! “Wish you were here” – engaging in tranquility on Lil Rabbit Key. Meeting up with “guest” sailor Joe S. aka Painen Dias just offshore from Little Rabbit Key! The four of us proceeded to make our way due northwest towards the Johnson Key Chickee platform. The winds were very light, forcing Joe to “pump” the sail much like a windsurfer would to try and catch some wind. Joe is an experienced lifelong sailor and made good time, though of course he had to tack, whereas we paddled straight on. The draft on his little flat bottomed sailboat was possibly even less than our kayaks, once he pulled the centerboard. It’s rare to see sailboats on Florida Bay, so this was a unique sight! Joe aka Painen Dias making his way towards the Johnson Key Chickee in his little “Goose” sailboat! Approach to Johnson Key Chickee in Florida Bay always reminds me of this one time ..
Once on top of the chickee we were thankful for every bit of a breeze but it was still bloody hot and making me see double, triple or whatever! Schools of fish underneath the chickee on another day when I saw a big Bull Shark cruising through here! Camping on the Johnson Key platform in Florida Bay. This is what the visibility was really like under the chickee. Last time I was out here the Port-a-potty was still missing and the chickee was closed for camping. With the new toilet it is officially v3.0 ! Oh the harsh chickee life, swinging in the light breeze, trying to keep my cool! Late afternoon light shimmering on the waters of Florida Bay. Fishermen dropping their lines into the deeper channel around Johnson Key. Another one of my delicious dinners featuring mussels in escabeche sauce. Peering at the nicest Florida Bay sunset of the trip! The nice thing about the chickees is that once the sun sets, it cools off to a very comfortable temperature! Loving the Milky Way over nearby Johnson Key! Reminiscing of another night on the chickee with Venus rising over Johnson Key. Full moon rising over the original Johnson Key chickee v1.0 platform on a previous trip. Are you picturing the tranquility? A sweet July morning sunrise from the chickee! Circular 180×360 panorama of one half of the Johnson Key chickee in the early AM! We were treated to a morning visit by dolphins hunting in the flats near the chickee. Harvest moon, Super moon, Blood moon and High Tides! Cooperative hunting behavior of Bottlenose Dolphins in Florida Bay. Full 360 spin-around view from the Johnson Key chickee platform in Florida Bay. Waving goodbye to Joe as he departs early for Flamingo. There goes Joe enjoying himself sailing miles away in the distance with the Flamingo Ranger Station behind him! Photographed at an equivalent 2800mm focal length. Looking due north back towards the Flamingo Ranger Station, standard view. Close up of the Flamingo Ranger Station, six miles away, as seen on a very clear morning at an effective focal length of 2800mm! Extreme telephoto closeup of the cell tower at Flamingo from six miles away on the Johnson Key chickee. Photographed here with “Hubble Jr” at a mind blowing 11200mm effective focal length! Pre-Hurricane Irma Carl Ross Key as seen from 7 miles away over the flats of First National Bank. Imaged at an effective 4500mm reach from the Johnson Key Chickee on an exceptionally clear morning! Departing the Johnson Key Chickee we headed due west towards possibly the most remote group of islands in Florida Bay. Today there are two or three if you count a small sandbar, but once these were all once just one large key called Sandy Key. That name today is reserved for a bird sanctuary with no public access permitted. The other key that splintered off after Hurricane Donna in the 1960’s has been called Carl Ross Key (CRK). This used to be an official backcountry campsite until Hurricane Wilma further split it into two in 2005. Camping there is no longer permitted, and today CRK is a seasonal day use only area and worth a drive-by visit en-route to East Cape as was our case! Johna approaching First National Bank in Florida Bay. First National Bank remains low even on a rising tide until the last couple of hours to high! Exploring the Underside of the Surface! Mirror to the lush forest of Turtle grass beds of First National Bank. Johna and Jenn breaking out of the grass beds of First National Bank into slightly deeper water. An overturned boat hull courtesy of Hurricane Irma still lies on the flats! A ‘bay scrag’ – an uprooted mangrove tree dispersed by hurricane Irma in 2017. After crossing First National Bank we pulled out onto the little sandbar in between Carl Ross Key to the north and Sandy Key to the south. This little spit is all that is left of a once larger CRK and can hardly be considered a key! Unfortunately for us we didn’t have much time before a large squall we dubbed the “apocalypse” came to bear down on us from the north. There is no place to hide, we were fully exposed here. I suggested we point the kayaks into it, get in and seal up! I held a tarp over myself as we rode out the quickly passing storm. This worked well and we stayed relatively dry. Although we didn’t know it yet, this was just the beginning of storm activity that was in store for us! Landing on a little sandbar island next to Carl Ross Key which was once the southern tip of the much larger island. This is all that’s left after Hurricanes Wilma in 2005 and Irma in 2017 passed overhead! Aerial view of the little sandbar with Carl Ross Key in the background. I was captivated by the blues in the sky and green hues of the water. Front row seats to the impending apocalypse! There is no place to hide from this. One option is to point kayaks straight into it and get in on land. This way we were less exposed and warmer. I had a tarp over myself during the thick of it. Drying tarps and things with post-apocalypse in the background to the south. Real espresso coffee is worth more than gold in the backcountry! I decided to check out Carl Ross Key proper, landing here at the north end. After sipping on a delicious espresso made by Jenn, I decided to check out Carl Ross Key proper. The island looks a lot better than it did in the aftermath of Hurrican Irma in 2017, though there is still a bunch of washed up trash. One particular piece is a 5 gallon bucket full of some type of sealing or roofing compound that has been there for almost a year now! I would remove it except it’s way too big and heavy to carry in a kayak. Somebody in a powerboat needs to pick it up and remove it before it spills it’s toxic contents onto this pristine island!! The July 2018 stub remains of twisted wood that inspired me to create “Extreme Birdwatching” ten years earlier. Back in 2008 I was inspired to create one of my favorite artworks “Extreme Birdwatching” from some uniquely twisted mangrove wood courtesy of Hurricane Wilma. Today after Hurricane Irma only the stub remains! Digital Surreal Art from Carl Ross Key in 2008! Carl Ross Key has the distinction of being the site where in April of 1832 John James Audubon collected his bird specimens on then much larger Sandy Key. From the many dozens and dozens of specimens he then painted his world famous bird portraits known as the “Birds of America“! 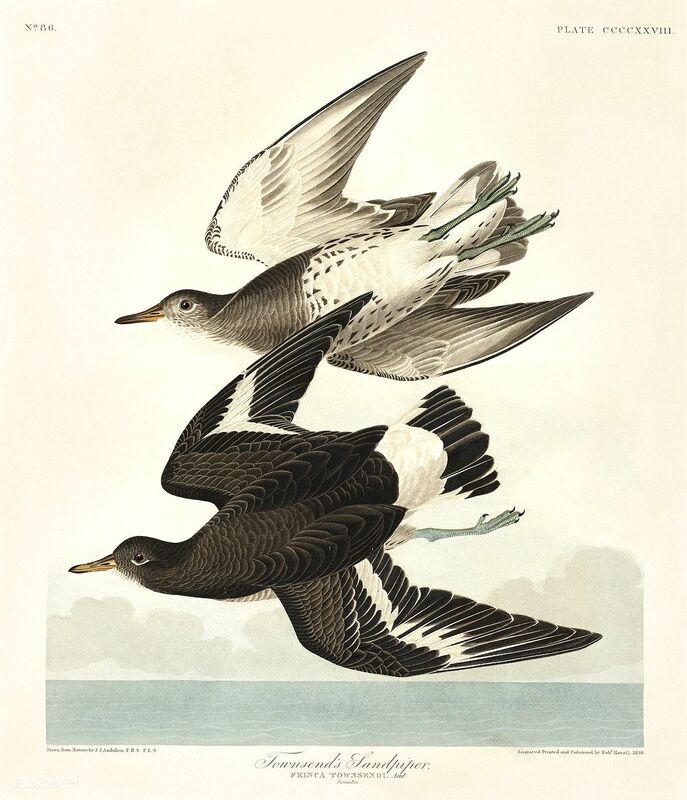 Townsend’s Sandpiper by John James Audubon in the 19th century. 21st century Sandpipers frolicking along the Everglades shoreline at Carl Ross Key. A White Heron wading in the shallows of Cark Ross Key. These three islands were once one big key called Sandy Key until the 1960’s! Further hurricanes continued to fragment the shifting sands to where one is essentially just a sandbar now. Our original plan called for only a stop over on Carl Ross Key, en route to camp at East Cape – a further seven miles away due northwest. However after returning to the sandbar the weather really deteriorated, esp directly due north where we’d be headed, and we discussed our options. We certainly didn’t want to be caught out in open water during a storm, and there was a lot of activity. Although camping on Carl Ross Key is no longer permitted, the Park does grant an allowance for emergencies in the interest of safety. In light of our situation it would be foolhardy at best to get back on the water, and possibly much worse. We would have to setup our tents right on the sandbar and deal with the coming storm systems as best as we could. Our only realistic option was to stay and ride it out on the sandbar! Dark clouds hanging over tiny Carl Ross Key in the afternoon. All sky 360 view of the lightning show on the horizon that was coming our way. Camp Kayakfari tent on the little sandbar between Carl Ross and Sandy Keys. Setting up my tent on the little sandbar I anticipated strong wind gusts to come, so I was glad to have my extra long 10″ tent spikes. I also covered the (north) leading edge of my tent fly with plenty of sand to keep it from lifting. This was my feng shui orientation with tent entry on the southern leeward side! What followed next were over two hours of storm and lightning activity, some of it directly overhead. The strong gusts from the squalls were easily 35 mph, possibly up to 50! I rode it out with my feet in the tent corners, my left hand pushing/propping up the side of my tent and my right hand outside tent, holding down the fly taut! Several times I was sure that my tent would collapse on top of me at any moment, but it held up, even with one broken pole segment! Enduring the lightning was not pleasant and I was momentarily blinded by the extreme brightness a few times!! Between all the activity there was a lot of noise, and I couldn’t see anything outside. During the few brief teasing lulls I shouted out to Johna and Jenn to see if they were still out there! Not hearing back a reply, I wasn’t sure what to expect after it was finally over. Thankfully we were all still on the sandbar! Johna was in her bivouac and thus had the lowest profile. She also had a direct view of all the action and called it our early July 4th fireworks!! Jenn’s tent was positioned sideways to the wind and I had loaned her my extra regular sand spikes. I don’t know that they held, but I think she ended up pushing her tent on the side into the gusts to keep it from collapsing! All in all it was quite the experience, much more than we had bargained for and we were glad it was all over! My tent held and stayed put through it all thanks in part to my custom extra large 10 inch spikes. Scenes like this are really only fun to watch from a safe distance! After all the storms cleared out , the moon came up as in this time-lapse from the delicious darkness. After midnight the tide really dropped. The mud flats extended for miles around in all directions! The low tide flats reminded me of another summer time camping on a really tiny sandbar in the Lower Keys. Oh the darkness of the Everglades and Florida Bay! We packed up at dark’o thirty and paddled off to take advantage of the high tide and experience the sunrise on the water! The pre-dawn light reminded me of another time on Florida Bay .. Settling into the soul permeating wetness of a summer morning on Florida Bay. “Bay scrag #1” from Kayakfari ART photography. Buzzard’s eye view aerial of the Oyster Keys, en route to Flamingo in Florida Bay. Enjoy Jenn’s video of the trip!